Whether you define your style as traditional, contemporary, minimalist or "something else," it's that "something else" part that really makes your home yours. There are many ways you can augment or change a room's perspective, and two ways are by incorporating glam or rustic elements into your space. Often inspired by antiques, glam or rustic furniture pieces, when combined with the right accessories, give a room more eclectic character. It's really how you mix all the elements of a room that defines your personal style. Glam || Whether it's a mirrored nightstand, shiny metal table or whimsical accessory, these are the pieces that always look on the bright side. Metallic finishes, gilded accents, ornamental fabric trims and glossy paint surfaces can add a touch of chic opulence, especially if you contrast them with traditional pieces and rustic surfaces. And, when you include sensual curves, animal prints and intricate textures, you'll elevate the glam factor to superstar status. 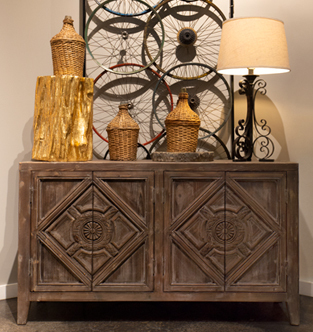 Rustic || On the other side of glam are rustic furniture pieces that exude an industrial, down-to-earth vibe with matte distressed finishes, knotty wood grains and straight-lined geometrics. They have an authentic lived-in look, and they're often in darker colors. Think of natural brick or stone walls, exposed ceiling beams, nailhead trim, and corrugated metal. One of the easiest ways to achieve rustic style is with a leather sofa, chair or sectional, which will just get better with age! Extras || To make your space truly eclectic, add personal items like photos, artwork, antiques collections and one-of-a-kind pieces that you've gathered from your travels. The way you mix, arrange and display these elements will reveal your true style personality – your blueprint for living your best curated life.